In our search for the best baby bouncer available, many parents have recommended the Bright Starts Bouncer to us. We decided to look in to why this is such a popular choice. There have been many different popular versions of the Bright Starts Bouncer released over the years, and each year they innovate and improve their designs. This year they have introduced a model with a pinwheel toy bar design, allowing all the interactive toys to spin. When looking for the best bouncer for you baby, there are many factors to consider. 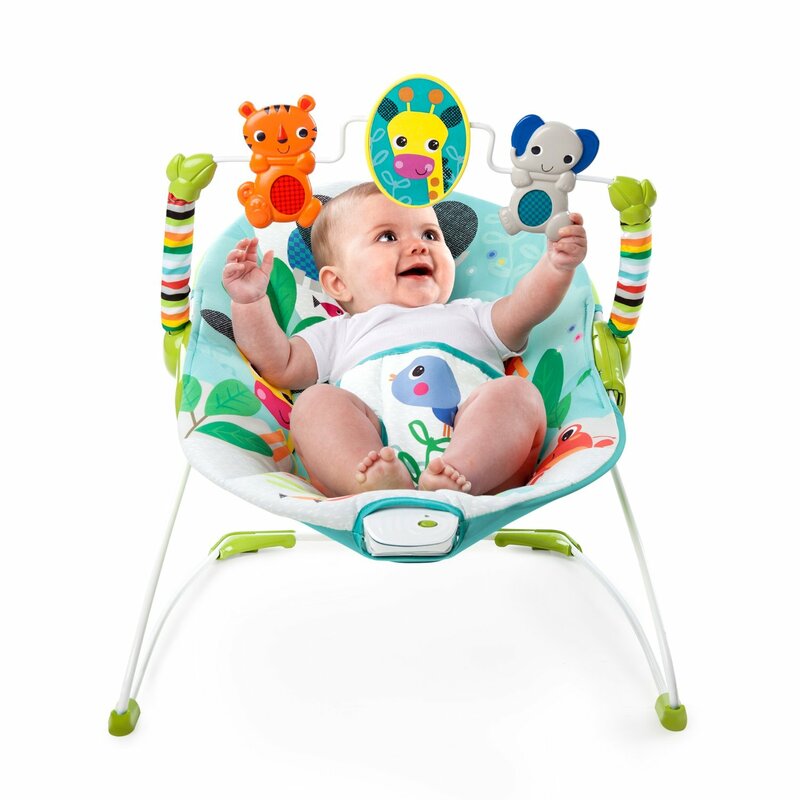 The Bright Starts Bouncer holds up great in each category. This is where the Bright Starts Bouncer really shines. It’s one of the most reasonably priced bouncers out there, and you get all the same basic features of other more expensive bouncers. The great design of a Bright Starts Bouncer is apparent right from the moment you start to set it up. It has a thin metal frame and is lightweight and portable. No tools are required and the pieces fit easily into place. It requires 1 C battery that is included in the box. Assembling the toy bar is trivial, and it is also removable so you can easily get access to your baby later. The seat pad is machine washable, and the toys can be easily wiped clean. The 3-point harness is easy to adjust, and you’ll have your baby safely bouncing to sleep in it in no time. It has a deep bucket seat to keep your baby from spilling out the sides. The chair sits high enough off the ground that their bottoms won’t hit the floor. The bouncing is gentle enough that it’s suitable for younger babies, and it’s designed so that the bottom part bounces more than their heads. The interactive toys on the toy bar make it fun and easy for little ones to start batting and playing. There is no automatic up and down bounce feature but the baby can easily activate it once they start kicking their legs. It’s easy to bounce them up and down in it. It has a soothing vibration feature that you can activate with a button. All of the Bright Starts Bouncers are beautiful, come in bright colours, fun patterns, and have cute characters. The pinwheel design toy bar comes in two additional color schemes as well. If you’re looking for more features, or more settings for control over bounce and vibration, there are other more advanced bouncers like the Mama Roo Bouncer that may suit your needs better. 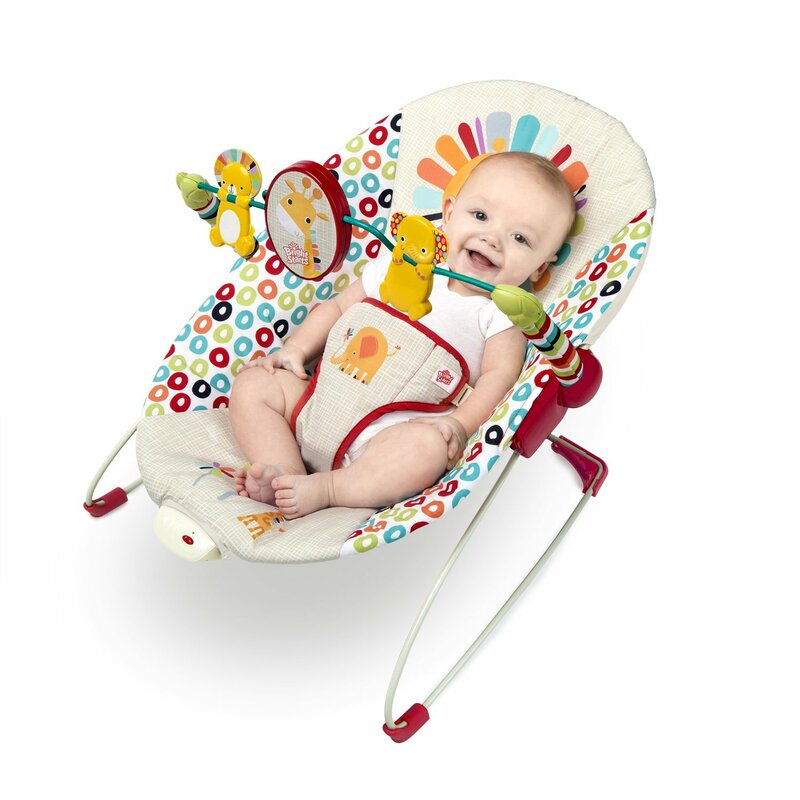 The Bright Starts Bouncer is sturdy and adorable basic bouncer that gets the job done. We believe that it is the best value for money spent.